September 16, 2016. Camp members participate in a youth-led demonstration in the state capital, Bismarck. The standoff between the Standing Rock Sioux tribe, their Indigenous and non-Indigenous allies, and Energy Transfer Partners, the company behind the Dakota Access pipeline (DAPL) is far from over. 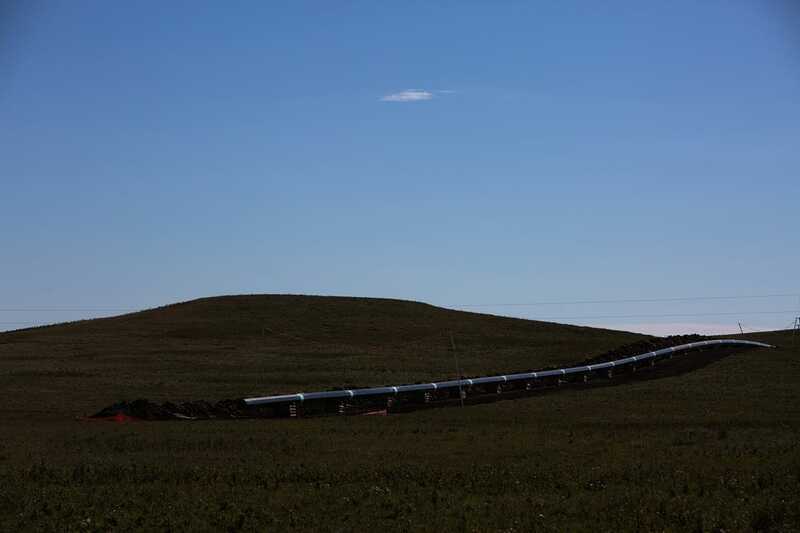 If built, the oil conduit will traverse over 1,800 km from North Dakota to Illinois, including under the Lake Oahe and the Missouri River, the First Nation’s main water source, carrying more than half a million barrels per day. 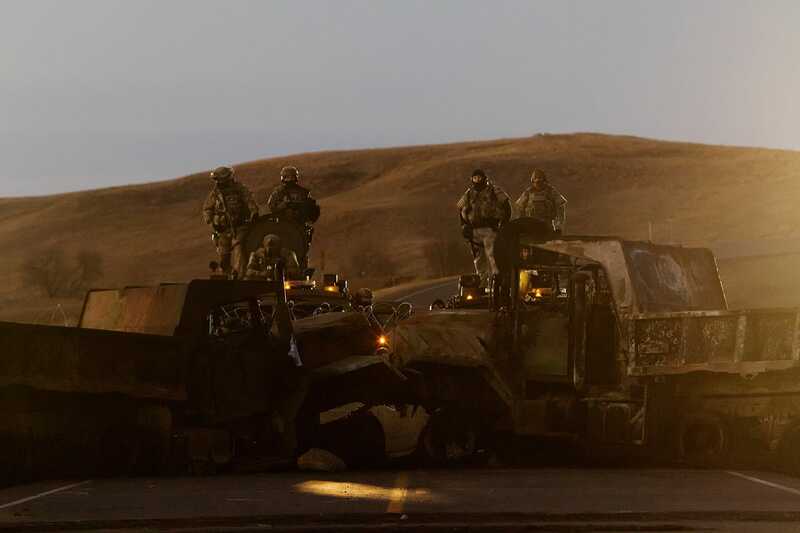 Though former President Obama denied the easement in December, acknowledging the risks associated with and the disruption caused by the project, the new government, under Donald J. Trump, overturned the decision, issuing an executive order directing the U.S. Army Corps to “review and approve in an expedited manner […] requests for approvals to construct and operate the DAPL”. 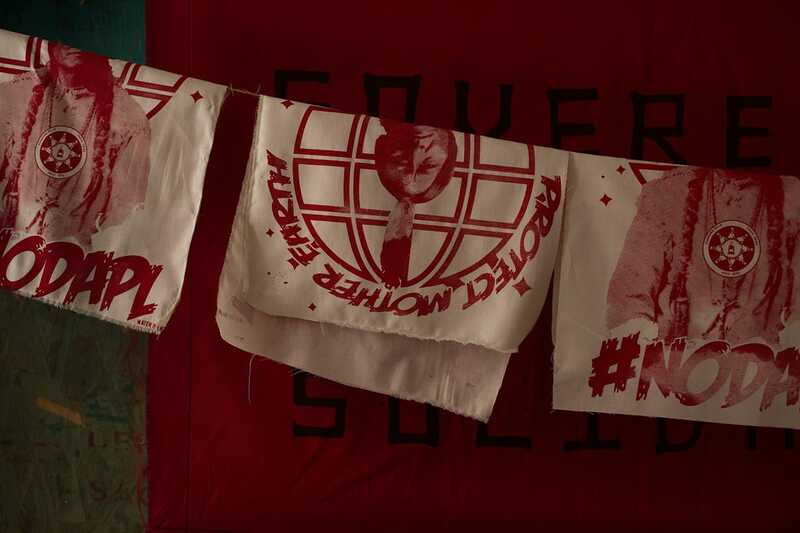 Amber Bracken has been covering the ongoing protests at Standing Rock since the fall. 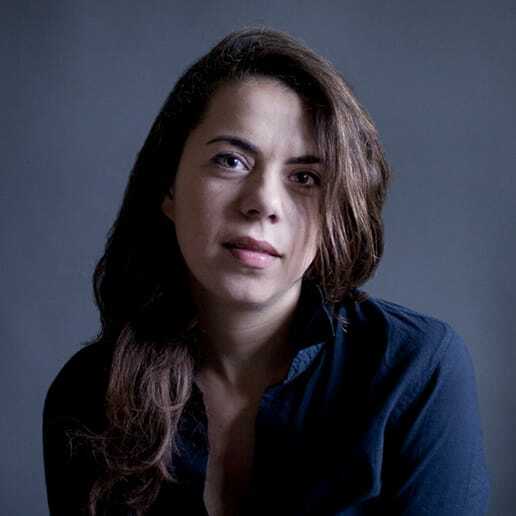 She recently received the 1st prize for contemporary stories awarded by World Press Photo for her work. Here, her impressions are accompanied by two different versions of the story. 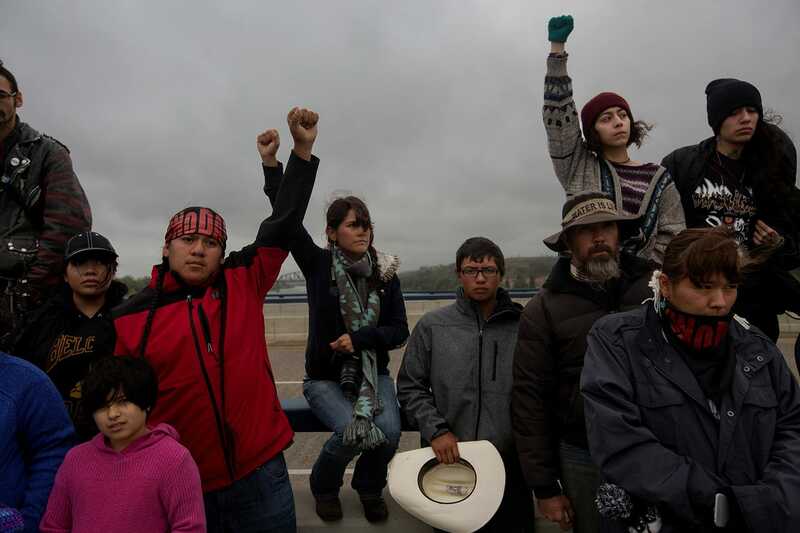 The first is from Vanessa Castle, a young water protector; the second from Deputy Sheriff Jon Moll of Morton County. I’ve been following Indigenous resistance movement for a while now, not because it hasn’t been happening for a long time, but because I grew up with the popular racist myth of “Natives not doing anything to help themselves”. As a result, I’m drawn to movements that demonstrate the contrary, where communities take ownership of the issues that affect them and lead the way to recovery from colonization, such as Idle No More and Unist’ot’en in Canada, and Standing Rock in the United States. Upon arriving, I was overwhelmed by the scale of it. Although I had seen powerful movements in the past, I had yet to see so many thousands of people standing in common purpose with such a general sense of warmth and excitement. There was so much energy and it was very inspiring. Because of the size, and importance of the event, I recognized that I wouldn’t be able to tell the definitive story. There are so many different experiences within the camp system. My job was first and foremost to listen. Yes, I had experience with other expressions of Indigenous resistance before, but it’s not a monolith. The Sioux are not the same as the Cree, the Dene or Wet’suwet’en people. Though they may have similar concerns, they each have their own ways. 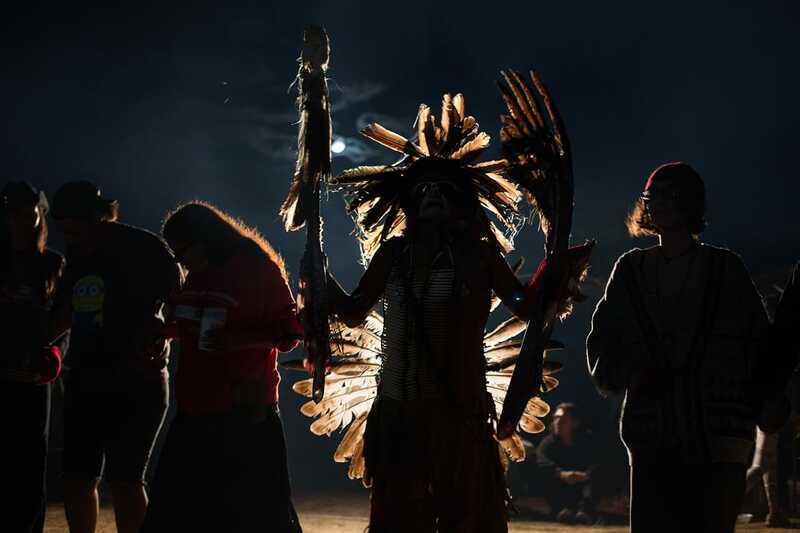 The biggest teaching I took from my time at Standing Rock, was how everything is prayer. There were obvious moments of prayer, such as the morning pipe and water ceremonies, or the sweats. But also, food preparation in the Lakota tradition is prayer, their interactions with their horses, also. There’s something beautiful to be said about leading your life with so much intention and awareness. September 10, 2016. 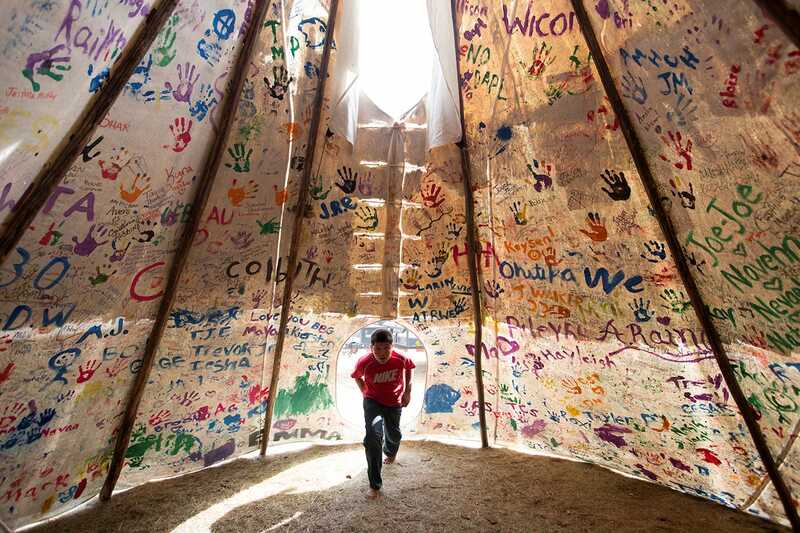 Jesse Jaso, 12, enters the Unity Teepee, at the Sacred Stone Camp near Cannonball, ND. The teepee is signed by camp supporters from all over North America and around the world. November 7, 2016. 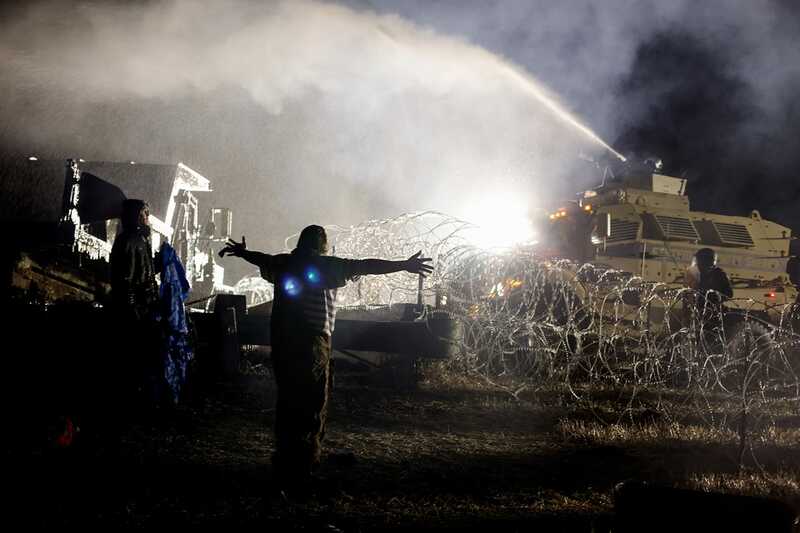 Police stand on top of a barricade, north of pipeline opposition camps and Canon Ball, North Dakota. Government forces are equipped with military type vehicles and equipment. December 5, 2016. 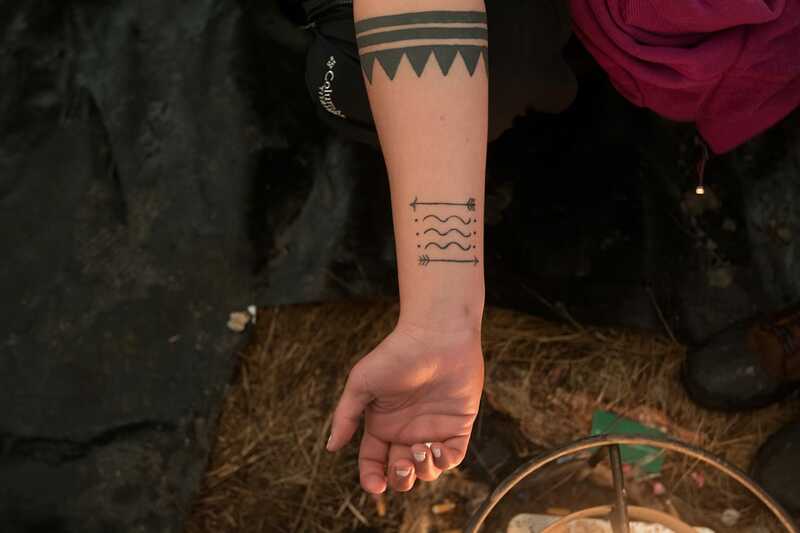 Vanessa Castle shows her water protector tattoo, designed for and by committed camp members. She’s been entrenched on the land for months and doesn’t intend on leaving without a fight. November 15, 2016. 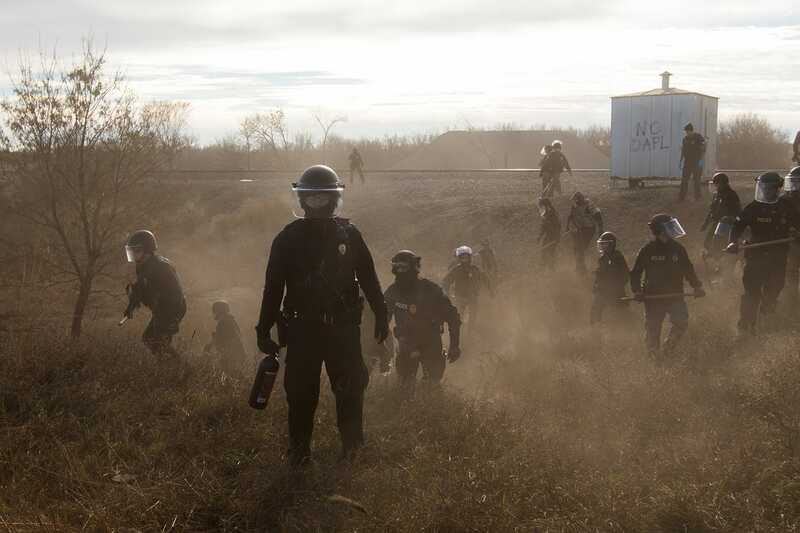 Riot police clear marchers from a secondary road outside a Dakota Access Pipeline (DAPL) worker camp using rubber bullets, pepper spray, Tasers and arrests. September 10, 2016. 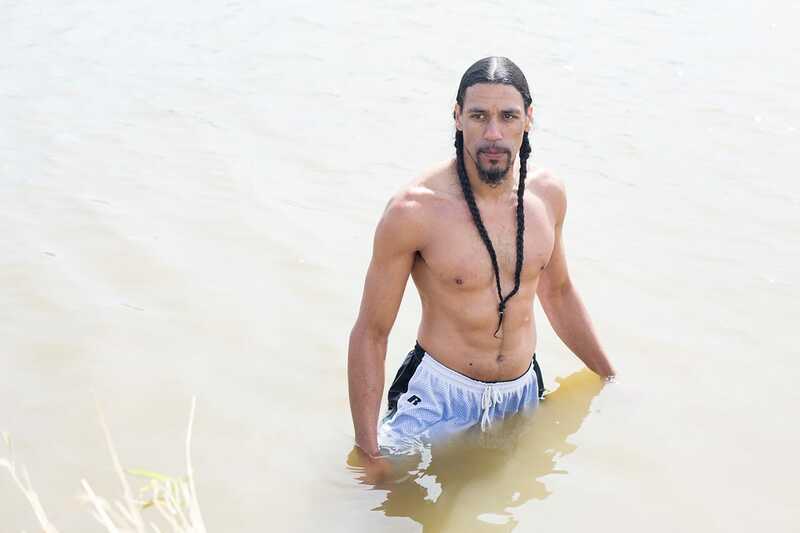 Amawon Weeden, of the Mashpee Wampanoag, or Great Water People of the First Light, in the Cannonball River at Sacred Stone Camp. “Water is our identity, it’s who we are,” he says. September 14, 2016. DAPL, if completed, will be approximately 1,172 miles, and pass under the Missouri River. November 20, 2016. Prints featuring Sitting Bull, the famous protector of the Sioux people, hang to dry in the Oceti Sakowin art workshop near Cannon Ball, North Dakota. September 10, 2016. Felicia just arrived from El Paso, TX, to the Sacred Stone Camp. 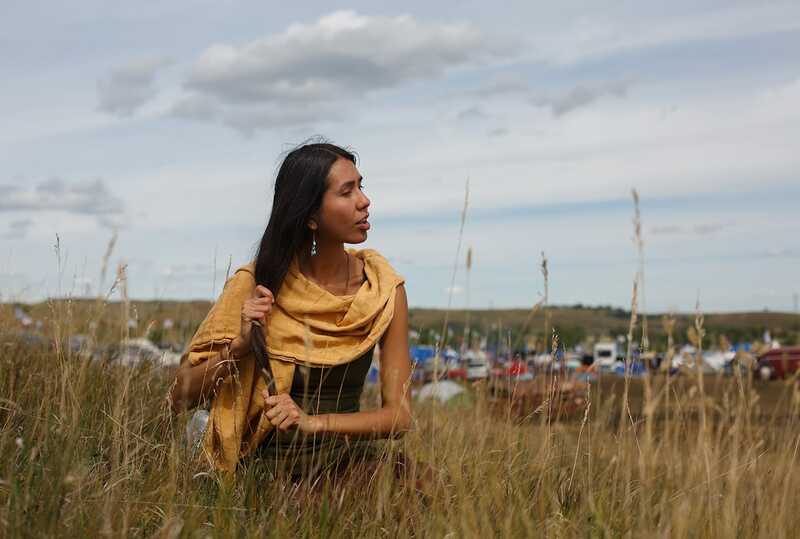 She felt a call to pray for the water and to stand with the First Nations. November 10, 2016. 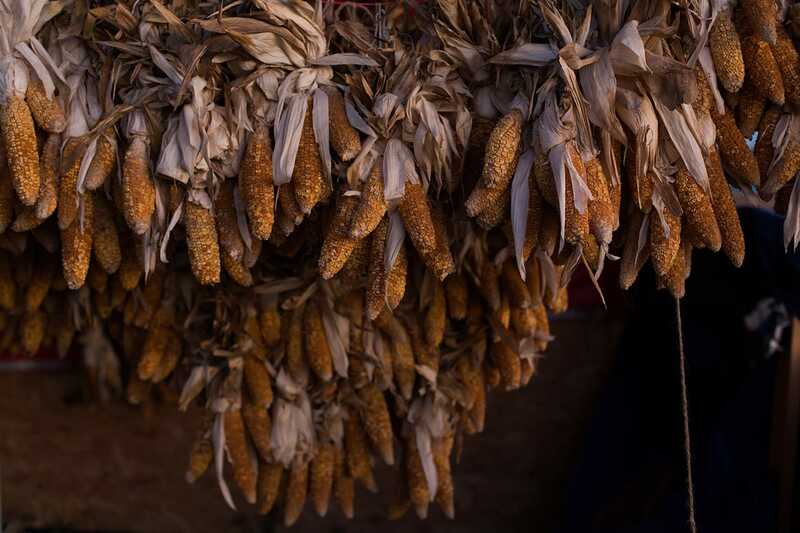 Corn hangs to dry in the DAPL resistance camps. Traditional foods are an important part of camp life and cultural reclamation. Prior to Standing Rock, I was a full-time pre-law student. I had been a social worker for almost four years; getting a law degree was the next step in my career to fight for Native American rights. I could only do so much within the court system as a social worker. Though I considered coming to Standing Rock early on, I put it off, because school took precedence. But, on October 27th, after seeing the North camp takeover unfold online, and our relatives being ripped out of ceremony, abused and beaten, I no longer could wait. I needed to stand next to them and help in every way that I could. I dropped everything, withdrew from school, packed my car and got here three days later. Before going, I reached out to my family and my Elders, to ask them if I should go. My family was directly involved in the stand off at Wounded Knee in the seventies, and the Elders who were at there told me that they had had their resistance, and that this was my generation’s time. Knowing that I had their support was significant. I wouldn’t have gone otherwise. Also, as a woman with no children, I go back and forth between whether or not to have kids. I need to think about the kind of world that I’d be bringing them in: will they have an earth that’s healthy for them to grow in? In the Pacific Northwest, where I come from water is everything to us. We live off of it. Our creation story comes from our river. We’re born out of them and when we die, we go back to the ocean. So we understand the significance of water. All of this contributed to igniting the fire in me to be at Standing Rock. I thought I had pack as best I can. I’m a backpacker and hike a lot, so it’s easy for me to live in the outdoors. But North Dakota is a whole other world. I was overwhelmed by the amount of support from people I didn’t know. They welcomed me with open arms, gave me everything I needed. It was hard for me because I always provided for myself to accept help from other people. It felt like you were stepping into a world where everyone was connected spiritually. The third day I was here, I went to the frontlines. We swam across the river and stood on the opposite shore it for hours to sing and prayed. Over the weeks, the situation spun out of control. At first, we were met with Mace or tear gas, but eventually it was with water cannons. 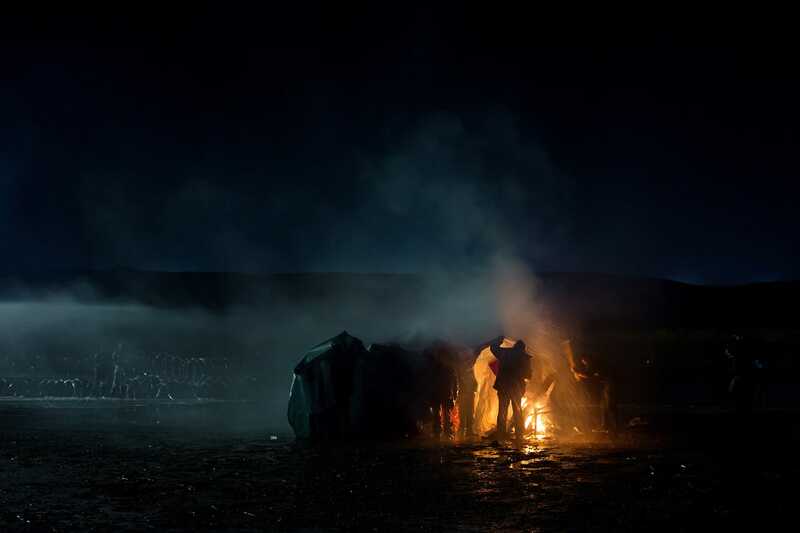 I was on the bridge that day and it dawned on us that people might die here. I kept wondering: is this really America? Is this how the United States treats people who sing and pray? Amber initially approached me asking if she could take a picture of me saddling up my horse. I was too busy and blew her off. But, she came to find me later on. One of the pictures is of my arm. Her images of the water cannons show the amount of force they were using. I wish it showed the peaceful unharmed people that there were coming against. When the easement was denied, it was too good to be true. To hear the Chairman say ‘you’re prayers have been answered, we won, we can all go home’ was a slap in the face. I wanted to be happy and to celebrate, but many of us also knew that it was only one victory within a much bigger war. We didn’t win the whole thing. The Black snake wasn’t killed. September 17, 2016. 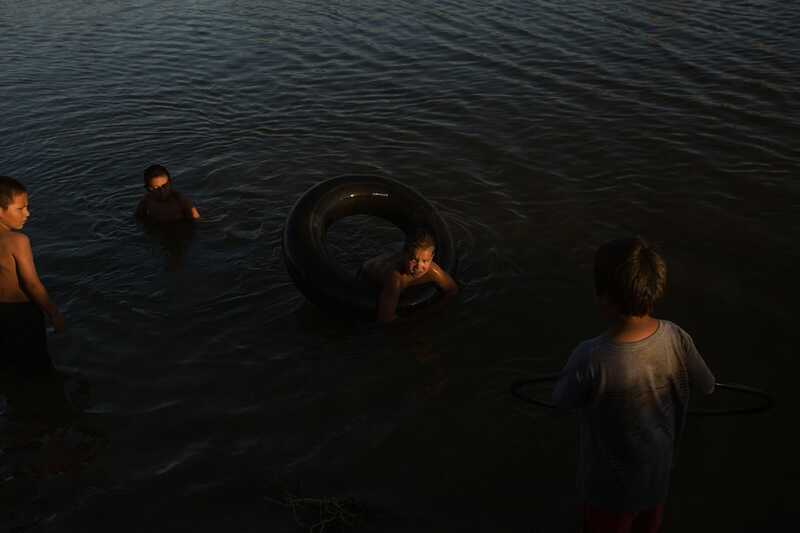 A family that’s part of the Standing Rock tribe and that just arrived from South Dakota takes an evening swim in the Cannonball River. “I don’t want to be killed here. 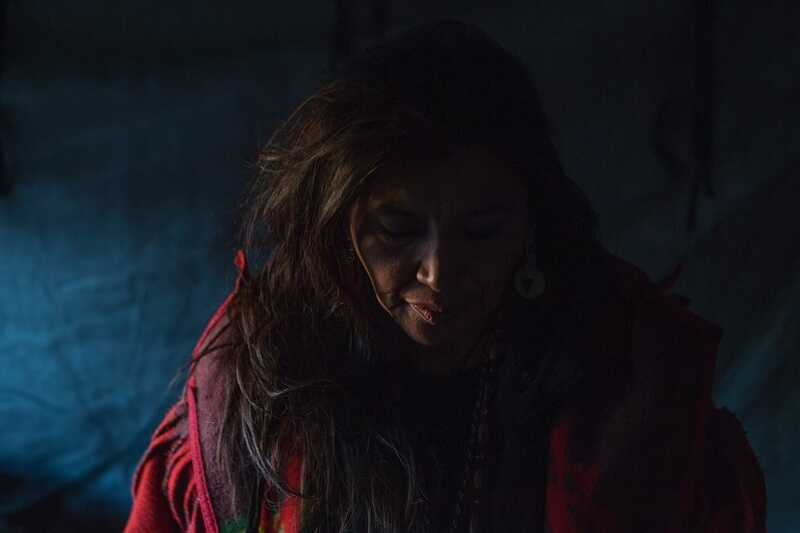 I came here to live with my children and my children’s children,” says Vonda Long, descendent of High Hawk, who was killed in the 1890 Wounded Knee Massacre. November 20, 2016. Demonstrators, or water protectors, struggle to protect their bonfire as police spray water cannons, despite temperatures below freezing. November 20, 2016. 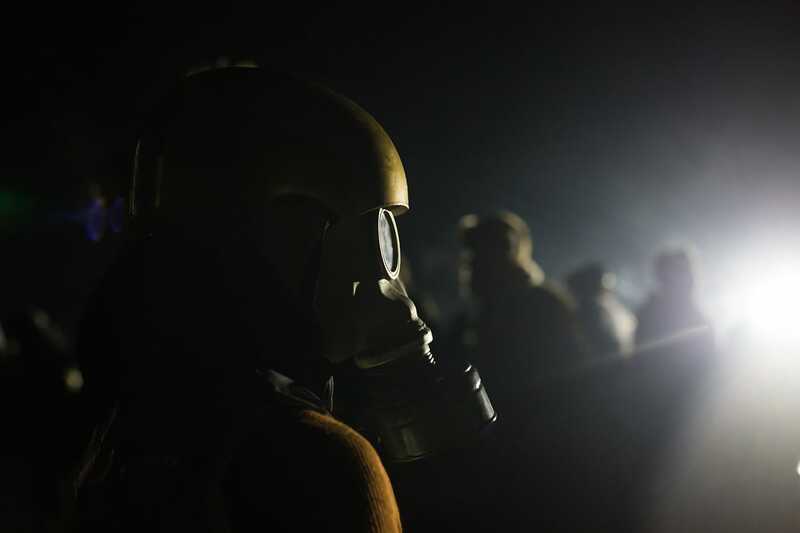 A water protector wears a gas mask to protect himself from tear gas and pepper spray as police fired on the crowd. November 20, 2016. A demonstrator, or water protector, sings and holds out his arms to show he is unarmed as police spray the crowd with water cannons, despite temperatures below freezing. November 20, 2016. 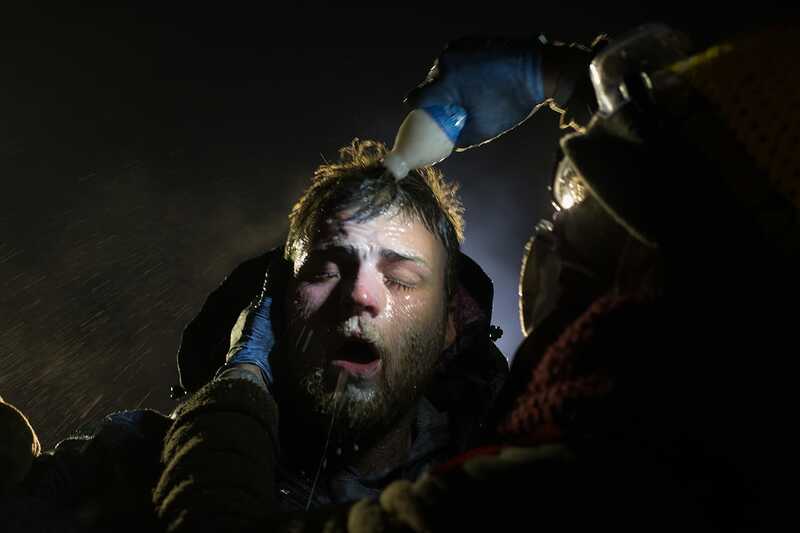 A man is treated with milk of magnesia after being pepper sprayed at the police blockade on highway 1806. September 15, 2016. A round dance at the sacred fire in Oceti Sakowin. November 13, 2016. 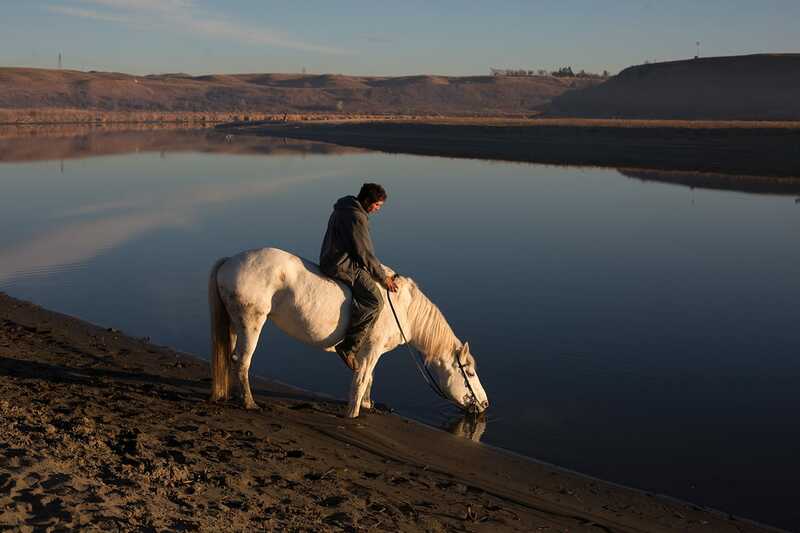 Stephen rides horse to the river. Horses considered “like my brothers,” by a youth, are central to Sioux culture. The Standing Rock situation is quite unique for North Dakota. Never before has there been a politically charged protest of this size and scope in our rural context. These usually happen in urban areas. And so, we’ve had to respond to that with law enforcement tactic that differ from those used in a city where there’s a finite amount of space. Out here, it’s wide-open country. There might be a fence, but that won’t stop anyone. The police force is reactionary. We react to illegal actions or concerning behaviors. The camp was set up on the Corps of Engineers land in Morton County, not on the reservation. The Standing Rock people have brought up that there may or may not Treaty Rights over that land. If that’s the case, than there are ways in our justice system to deal with that. What is not an appropriate way is to trespass onto private property. Those were the issues. We’ve met them by moving along a ‘use of force continuum’. The first level is officer presence. Then verbal command: “please stop doing X, Y or Z”. If they refuse to do that, we have to physically remove them or stop them from doing whatever they’re doing. In that case, we may have to use force. The more people resist, the more the force escalates. When we have to use force it’s not with the intent to injure or punish, but to get people to comply with the law. Using water hoses was one of the tactics we had to resort to eventually. There’s been misinformation and misrepresentation. We don’t use water cannons. We use wildland fire hoses usually used for grassfires. It’s a small diameter hose, low pressure. Probably the softest thing we’ve used to try to get people uncomfortable, try to get people cold, and hopefully they’ll got back to the camp and away from where they’re not supposed to be. Same with rubber bullets, it’s a misnomer. We used beanbag rounds out of a shotgun. They’re low density, pliable and have a wide surface area. They hurt, bruise but they’re not intended to wound or injure. There’s no lasting damage. The objective is to inflict a little pain because the person is resisting my orders to remove them from the situation. Stay informed about Zoom Photo Festival Saguenay’s Wide View and receive a notification when the next story is available. 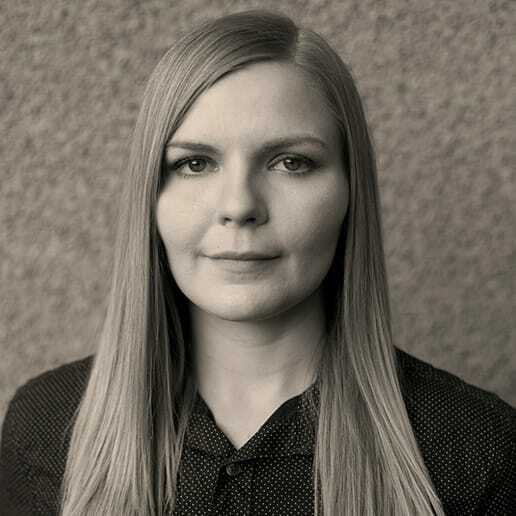 Amber Bracken is a member of the Rogue Collective and lifelong Albertan covering assignments across the province and farther from home. After getting her start as a staffer in daily newspapers, since 2014 she has moved on to a freelance career and the pursuit of long-term projects.